In the spirit of my “Help! My child doesn’t like books — 25 ideas to get your little one to love reading” blog post, I thought it’d be great to share some ideas for promoting WRITING as well. You can start preparing your child for writing as soon as they can hold a crayon–around a year old. Simply start by showing them how to make marks on a paper and go from there! 1. Practice fine motor skills as much as possible. These activities help to strengthen hand muscles and develop coordination and control which will help with pencil grip when it’s time to write! Start these as early as possible!!! Here is a post I wrote which has lots of fine motor practice ideas. 2. Make a sand or salt box. “Write” or make designs in it using a finger or some sort of utensil (a chopstick, a cotton swab, an unsharpened pencil). This is also a good way to begin letter formation practice. Gently shake the container from side to side to erase. I made some using salt and $1 tins from Michael’s. You could also do sand or salt on a tray or cookie sheet. Here’s one at Totally Tots. 3. 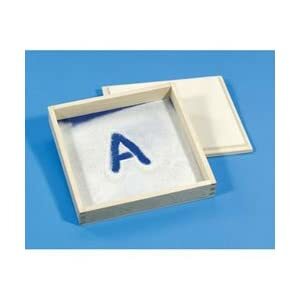 Buy or make sandpaper (tactile) letters. Practice finger tracing them. 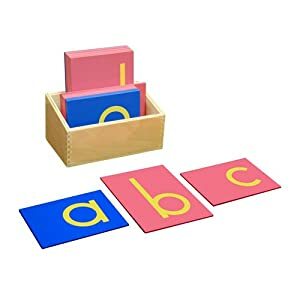 There are lots of different kinds available, ranging from nice (and expensive) wooden, Montessori sandpaper letters to packs that are a lot cheaper. We bought these handmade ones from Etsy and really like them. We bought these from Etsy. Here’s Luke with Mat Man. Both L&L *love* singing the song and building him! Luke’s drawing of Mat Man. This is a HUGE improvement over his normal “people” drawings! 5. Practice drawing. You can do it a couple of ways — free style or by following directions. Luke and I do both. We sit down together and we both draw. Sometimes we just make things up, but sometimes we use books that are kid-friendly to follow instructions on how to draw things. When we’re following directions, he draws in his sketch book that I got him specifically for this reason. I label his drawing and date it. It makes it feel special for him to draw in a book, but it also serves as a good record of how much he’s improving over time! Here are two posts I’ve added to the blog about our drawing: I Can Draw: Cars and Trucks! and Drawing for Preschoolers: Lightning McQueen! I also bought several books that I think are preschool-friendly, including: Kumon’s My First Book of Drawing and 1-2-3 Draw Cars, Trucks, and other Vehicles. 6. Do some type of writing/drawing every day. You can pretty much do this by planning some type of art or craft activity daily. It doesn’t have to be anything really extravagant — crayons and coloring books, plain paper and pencils, finger paint, sidewalk chalk and the driveway, etc. 7. Use a variety of writing utensils to keep interest high: crayons, triangular crayons, markers, colored pencils, pencils, oil pastels, window crayons, dry erase markers, dry erase crayons, chalk, paint brushes, sidewalk chalk. Very short pieces are supposedly best for beginning writers. 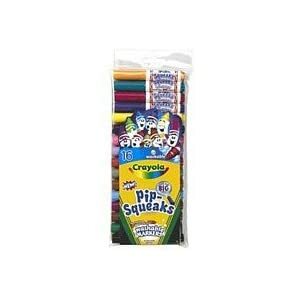 Crayola has a “pip squeaks” line of shorter-than-average markers and colored pencils which we like a lot. 8. Mazes, Connect-the-dots, and tracing practices are great for beginning writers. Kumon has lots of great books! Luke also likes the Crayola Dry Erase Activity Tablet: Construction Mazes and More! We found it clearanced at Michael’s for a little over $1. 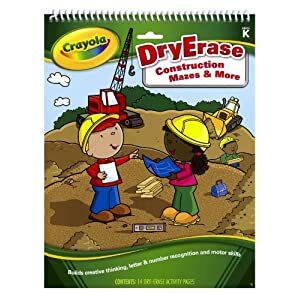 You can also save mazes and puzzles found in kids’ magazines or print ones from online and put them into sheet protectors so they can be used over and over again with dry erase markers or crayons. 9. Print or neatly write your child’s name in a “trace-me-style” dotted font. Laminate the page or put it into a plastic sheet protector. Have your child trace their name with a dry erase marker or crayon. I printed Luke’s full name in a trace-me font and slipped it into his Crayola Dry Erase Activity Center. 11. If your child likes cars, print these highway letter cards. Let your child practice “writing” their letters by driving cars on them. 12. Make cards often: birthday, thank you, miss you, etc. Let your child help you decide what the card should say. Depending on their developmental level, you can have them copy what you write on a separate paper onto the card, trace over what you write lightly with pencil, or at the very least, write their name with you spelling aloud and guiding their hand. 13. Get your child used to writing their name by having them write it on the back of everything they do — all artwork, crafts, coloring sheets, etc. Either post it somewhere nearby where they can see to copy it, or write it for them on the paper and have them trace or copy it. 14. Write stories with your child. Have them dictate and you write for them. These can be summaries of your day, a description of a dream they had, a story they make up using their toys or a picture, or something you concoct together. Modeling and writing for them shows them it’s important and gives them experience with what the writing process is like. You can put their stories into a plastic folder with plastic sheet protectors so they can read them like a book. It’ll be a great keepsake, too! 15. Finger trace letters in the air. Use different parts of your body as the writing utensil: your pointer finger, your elbow, your toes, your nose! 16. 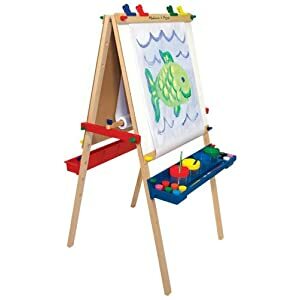 Write and draw on an easel. This is supposed to be REALLY good for pre- and beginning writers. 18. Write or draw on a Magna-Doodle, Aqua-Doodle, or Buddha Board. 19. Make your child a writing box for pretend play. Stock it with paper, crayons and pencils, envelopes (you can save them from your junk mail! ), and stickers that can be used as stamps. As a bonus, add a mailbox for extra fun! Apartment Therapy has a really cool writing box post here and check out ikatbag’s awesome post about how to make a mailbox out of cardboard boxes! 21. Practice drawing and writing in shaving cream. For easy clean-up, squirt the shaving cream onto a tray or large cookie sheet, but onto a table works, too. 22. Drive cars on letters using paint. Cut letters out of paper. Use cars dipped in paint to drive on the letters in the way you would write them. 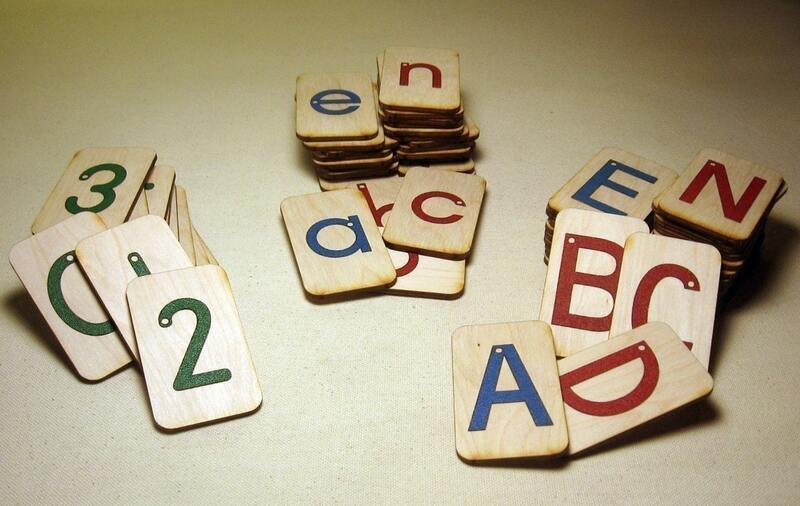 You could also do this just using letters, paint, and fingers if your child isn’t into cars or as a variation. See Juggling with Kids’ post here. 23. Build or make letters using various materials — Wikki Stix, Play-Doh (homemade is usually easier to manipulate), Lego, buttons, Zoob, cereal, beads, wooden blocks, pretzel sticks, pipe cleaners, etc. 24. Put paint, gel, or shaving cream into a plastic bag and seal it. Lay it on a table and put tape across the top to keep it from moving around. Let your child practice writing using their finger or a Q-tip to press into the bag. You can see this in action on the Let’s Explore blog here. 25. Practice writing in the sandbox or on the beach. Use your finger, a shell, or a stick to write. Wet the sand if necessary. Calling All Kindle Owners: In Lieu of Preschool is now in the Amazon Kindle Store!!! 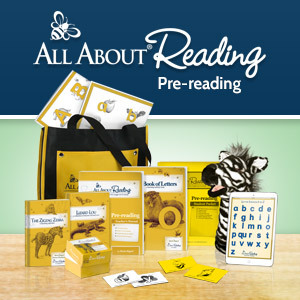 Thanks for collecting all the resources into one spot for working on Handwriting skills! Wow! I am so happy that I saw and read your post! Thank you! Lots of excellent ideas! Great list and really helpful. Pinning it right now. Thank you. You idea list is incredible! We did some of the things you mentioned, but I am eager to try the others with the kids. I am very excited to be doing short stories: actually, I wish I had thought of this wonderful exercise earlier. Thank you! I love your post I can’t wait to try these. We purchased the Writing Without Tears (preschool) version. My son is diagnosed with DS, he’s 6yrs old and is just not quite comfortable writing yet. He still switches between his hands and we are trying to get him to focus on one. I have the OT at school to start working with him on the WWT package but she doesn’t seem to excited. I brought it so all she has to do is work with him. I think I am going to keep it home and work with him this summer. Feel it will just sit at school. But wonderful ideas, thanks. I’m an OT as well and loved this post! Another great fine motor strengthening activity that is great as we approach summer is letting kids play with spray bottles. You can find kid-sized ones at the dollar store. 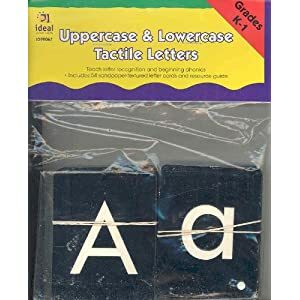 They can do tons of stuff with spray bottles and it’s a perfect activity for developing the side of the hand responsible for writing and cutting with scissors. Thanks for the great post! What an amazing post! We have a lot of these things already. I think after reading your post I need to put them into a writing center. Such a great collection of ideas. Gonna try some that I hadn’t thought of. Thanks. Great post! And we often use spray bottles at playtime.